One of my latest projects is going full force! You may have seen the logo I developed for OrigAudio’s Spring Forward Tour, but if you haven’t…here it is on the right. 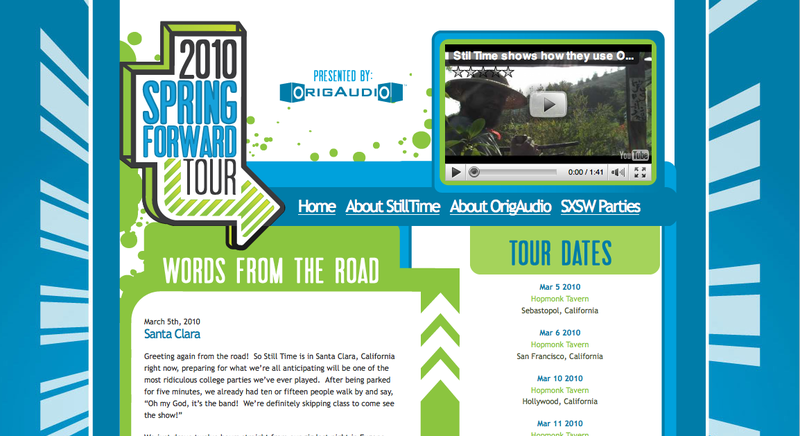 OrigAudio is sponsoring the band StillTime on a west coast tour that ends at SXSW in Austin, TX. The tour now has a site that is up and running so that you can follow StillTime while they are on the road. Below is a screenshot of the design, but be sure to stop by springforwardtour.com to keep up on the latest info from the road, listen to some tunes and see pics too.